At DCIP Consulting Solutions, S.L. (inviTRA), we have implemented an equality and diversity policy, because we believe in the right of inclusion for everybody, regardless of their sexual orientation or varied profiles, in the work environment and the society. 70% of our staff is composed of women, and our CEO is also a woman. We spread information related to reproductive treatments for the LGBTI community, because we believe that everybody deserves the right to become a parent and to be well informed. Our staff and contributors are a team composed of people from different countries, which favors cultural diversity. We do our best to balance family and working life by adapting the timetable of the staff who is responsible for a family. 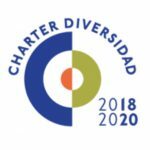 Keeping this in mind, our project is part of the Charter Diversity program, a project pioneered by the European Commission and the Ministry of Equality of Spain.